A beef specialist has been hired as the director of the University of Nebraska-Lincoln's Northeast Research and Extension Center at Norfolk. Twig Marston currently is a professor of animal science and industry and a beef extension specialist at Kansas State University. "We are delighted to have attracted Dr. Marston to this key academic leadership position for Northeast Nebraska," said John Owens, University of Nebraska vice president and Harlan vice chancellor of the university's Institute of Agriculture and Natural Resources. "Twig already is quite familiar with Nebraska agriculture, especially our huge livestock industry, and we know by working closely with the highly productive faculty and staff already working in Northeast Nebraska, and in cooperation with the large number of extension volunteers supporting 4-H and other IANR programs, he will have positive impacts on our research and extension activities for the benefit of Nebraska communities, families, and businesses." Marston has been at KSU since 1995 after an earlier stint there from 1988-91. He's also been senior beef nutritionist at Hubbard Milling Co. in Mankato, Minn.; ranch manager for Hoyt and Sons in Blair; and a partner in Farm Partnership, Wal Mar Farms, in Canton, Kan.In his current position, Marston oversees programs for beef cattle improvement and production and conducts applied research concerned with postpartum interval, animal health, bull development, cow nutrition, genetic improvement and marketing strategies. Marston received his bachelor's degree in animal nutrition from Oklahoma State University in 1977 and both his master's in animal breeding and genetics and doctorate in animal sciences and industry from KSU, in 1991 and 1993, respectively. Marston is expected to start his new position in May. Marston replaces John Witkowski, who retired. 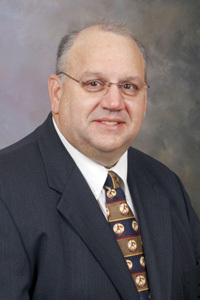 Dennis Bauer has served as interim director of the center.